Chocolate like this, you better have a high metabolism. That’s right, I’m back on some kind of food again! Because this variation of the Shu (not unlike Shu of Borg) seeks to assimilate the fine things of the world and become a perfect being. 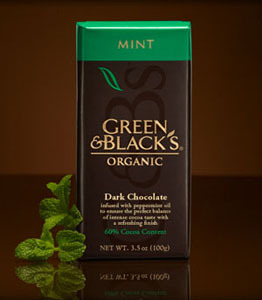 Well…I’m not quite there yet, but this minty dark chocolate from Green and Black certainly does help. Okay, that’s also a bit of a fib as well. But I promise it’s really good! There’s a number of things I like about this bar in comparison to the other minty bars of chocolate I’ve had in the past. Only a few things I don’t. The taste certainly does have the mint you’d be looking for, but it doesn’t hide the chocolate as some chocolate will. Andes mints tend to do that to me a lot, but those are still good too in their own way. How the mint is put into the chocolate is even stated on the freaking wrapper. It’s “infused with peppermint oil” and it certainly does work for the better. Instead of trying to make a layer of mint that undoubtedly take over. Another thing is that this particular 3.5 oz bar had going for it is the way it was solidified. You know those old Hershey bars that had those big bars inside the even bigger bars? Well, imagine that, except those really big bars are now small bars part of a big bar. Unless you’re the kind to just bite the chocolate without breaking off a piece with your hands, that alone will make this bar last for what seems like forever. Casually eating this, it’s been about 9 hours since I’ve started to nibble away at it. Still not done. Oh, also this bar is “suitable for vegetarians”. The label even told me so. Which leads me to the two things I do not like about this. Or…maybe I do like one of these two, but it’s in a negative tone. The first being the fat content of the bar. 37.5 grams of fat per full bar make me glad that I have a high metabolism, or I’d be feeling guilty about touching this bar. More saturated fat than a king size Snickers bar, I’d probably have more because I never watch my weight, but depending on who you are, you might want to. The other thing I believe is just for luls. lol I get how this can happen, but really, cmon. The wrapper says “Made in Italy” and I’m thinkin’ that this means that it must be fancy. Then I open the wrapper and on the inside it says “USA”. Stop lying to me wrapper! You just told me Italy! If you’re going to make the chocolate in Italy, at least make the wrapper in Italy too. I want 100% fancy instead of just 80%! So help me, if the next thing that I buy to eat does this, I will smite it so bad. It’ll wish I didn’t smite it so bad. All in all, I give this fancy chocolate an 8.5 explosion rating! If only good tasting food didn’t have to be so bad.